Color of the walls: The color chosen for the dining room should make people feel warm and comfortable. The latest trend is coating the dining room in a softer tone as compared to the earlier days. This helps soften the ambience and provides the ideal backdrop for serving a warm home cooked meal. Storage: The dining room storage has to be used effectively; storing cutlery and crockery in a sideboard or keeping them in a basket is practical. Bars can be set to serve quick meals. Choose the right dining table: The shape and the size of the dining table should match the décor of the dining room. Bigger dining tables can be used for occasions when more people get together. Foldable tables are recommended for dining rooms that are small and have people walking around a lot. Lighting: Lighting in the dining room has to be sufficient, during the daytime there has to be enough sunlight in the room and during the nights the light must lend a subtle atmosphere. Furniture: Furniture should be in the right shape and size so that they will not block the way and become a hindrance. It must be comfortable and durable. Windows: Based on your dining room décor, cloth drapes made from different fabrics or bamboo roll up blinds can be used. Adorn the walls: The walls of the dining room can display decorative pieces in a theme and form that is most suitable for the dining room decor. Tableware: Tableware is critical to an exquisite dining room setting. Modern dining room décor: Cool colors are always chosen over the rest for modern dining rooms. A blend of wood and metal furniture lends the room a stylish and neat look. 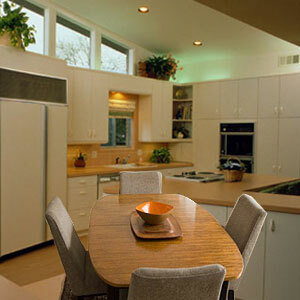 Contemporary dining room décor: Dining rooms designed in this manner bear a classic look. The dining area color is kept sober to give the room a stylish, formal and sophisticated look. The lighting has to be soft and a chandelier over the dining table is a preferred choice. Country style dining room décor: The main principle behind this style is making the place casual and friendly. The colors of the room often resemble colors of nature. Formal dining room décor: Warm colors such as yellow, orange, red etc can be used to add on to the warm and graceful atmosphere. Even casual parties hosted here throw a very impressive look. Ideas can be borrowed from hotels and restaurants as they specialize in adding a warm touch in a formal atmosphere. First Published Date: 31 May 2005 Last modified Date: April 18 2019 This page may have been updated recently as new information is available or the content may have been edited for better readability.